When I thought the first time about catching a boat from Asia to Australia, I didn’t think that it would be such a big problem. The distance between Indonesia and Australia is really not that far and I thought there would be some kind of ferry going somewhere from Indonesia to somewhere in Australia. A few cargo ships out there also take passengers along on their cargo routes. There are several online travel agencies where you can book cruises on a cargo ship all over the world. 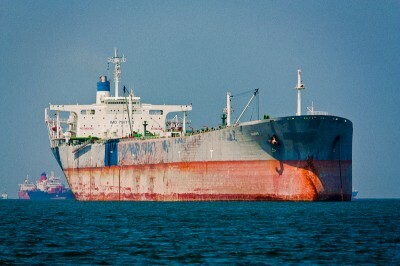 For example the company http://www.freightercruises.com. These two cargo ships are the only ones I found which go from Asia to Australia and also take passengers. All the travel agencies I looked up offer the same cruises on these two freighters. The MSC Basel was the only really interesting option for me and I inquired about a cruise with it directly at its owner Laeisz in Germany. The reply came immediately, however the next date for an available cabin on the freighter was 4 months ahead. (The freighter goes every 8 weeks and there are only two cabins for a maximum number of 4 people on board) This date was too late for me. At the MSC Basel you would pay 90 Euros per day (or 80 Euros per day if the cabin is shared) and an additional 192 Euros for the whole trip. There are actually many cargo ships going from Singapore to Fremantle and I wrote emails to all their owners asking them if they would take passengers. Only one company wrote a short reply, saying that they don’t take passengers. Another interesting way to cross the sea is to join the crew on a sailing yacht. I found a yacht that went from Thailand to Australia on www.findacrew.net. This website provides a platform where boat owners and potential crew members can sign up and search for each other. Boat owners there are either looking for passengers or for working crew or sometimes even for a romantic relationship. As a passenger you would typically have to pay a daily rate. Working crew positions can either be paid or unpaid. Prior sailing experience is often not required. The boat I found, a 15m long Bavaria 49, was on a boat delivery from Turkey to Australia. I joined the crew as a deckhand in Thailand. I didn’t have any sailing experience before. As I found out later, you normally don’t have to pay if you are crew on a boat delivery (neither will you be paid). However my deal was to pay 30 USD per day to contribute to the costs for food, fuel and marina fees. Since this boat was the only one I found going from Asia to Australia at this time, I didn’t really have another choice anyway. The basic sign up on www.findacrew.net is free. However you have to become a premium member if you want to contact non-premium members and the fee for that is quite high. If you know another premium member, then he can find out the contact details for you. There is a guy with a premium acount on www.couchsurfing.org who does that for you. Just search for findacrew on the couchsurfing group search and you will find him. The skipper of the boat was an experienced sailor, and found the boat by writing to one of his sailing contacts who was a friend of the boat owner. A french couple, who joined us in Bali, were desperately looking for a boat from Indonesia to Australia for weeks. They also put a note on the notice board at the marina in Bali, but they didn’t get any reply. 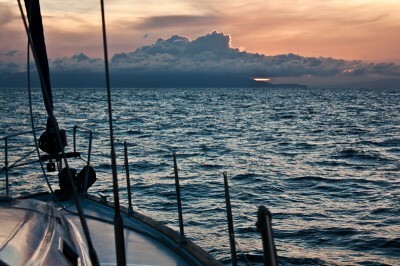 Then they found the blog from one of our other crew members, who was writing about our sailing trip and our stop in Bali. The french couple wrote him a message asking if they could join us and it worked out. Another girl from India joined us on the cruise from Singapore to Bali. I met her on a couchsurfing meeting, and she spontaneously decided to join our boat. At last there was a lucky french guy, who didn’t really plan anything but just walked around at the marina in Bali one day asking for a ride to Australia. Very luckily for him, that’s how he found our boat. 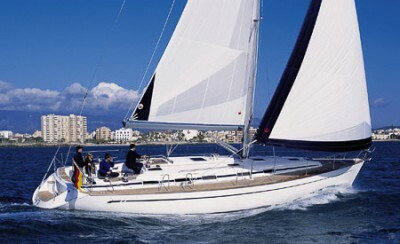 Another site, where we later found potential cruises from Asia to Australia, is called www.pacificyachtdeliveries.com. These guys do boat deliveries only, and as a crew you don’t have to pay. As a deckhand you also don’t necessarily need sailing experience. Please feel free to post a comment if you know of any other ways on how to cross the sea between Asia and Australia. Unfortunately, I have already posted everything I know about how to get from Indonesia to Australia on a boat in this post and I can’t give any more advice. But you can follow my blog, where I will soon continue writing about my sailing trip. I’m traveling by bicycle and need to make it from anywhere in the red continent to somewhere in Asia. Ideas? Hey! I think the sites above are also useful for the other way around. I know a couple who made it from somewhere near Cairns to Bali using findacrew.net. That’s all the info I have. Good luck! Holy sh.t thats amazing. I live here and so wanna get to Melbourne, did you work on the boat and was it worth it? Such a valueable information for people finding sea way to australia. I am from pakistan and i want to go to australia through sea. I will tray eith your guidence and if i face any dificulty i will contact you. One thing i wana ask about visa of australia is that nececery and how we can get easyly. please send a copy of answer through my emale. Don’t worry about not getting in contact with immigration in Australia. When you are still a couple of days away from the mainland, you will already be checked by patrol planes. 😉 As you get closer, patrol boats will also check you. Therefore, make sure you can always hear you radio device. Once you get to the shore, the border police will tell you were to go for check in. In Darwin, there is a check point right before you enter the marina. Oh, and I forgot, the boat owner has to let immigration know that you will sail to Australia, before you start your sailing trip! Question–how long was the actual stretch between Bali and Darwin? As in how many days from port to port (and thus how much money one might need to have ready for that crossing)? Thanks for a great post man. The trip from Bali to Darwin took us 13 days. See also the post “Sailing part 3: Bali to Darwin” . Good luck with finding a boat in Bali! Ah, and one other question. What is the largest marina in Bali? Are there several? In case findacrew doesn’t pan out, I’d like to figure out the best place to “thumb it”. We stayed at the Bali Marina. It’s not a big marina. I don’t know if there are any other marinas for sailing yachts on Bali. But the island is not that small, so there might be. 1. your journey sounds compiling where are you at this moment? 2. what will the Australian authority do if you are on a sailing boat heading to Australia without a visa or a permit? 3. is there an Australian authority there in bali to issue a permit or a visa? 4. have you herd of a sailing boat heading to australia with crew members that doesn’t have a visa? 5. what can i do while i am still in Ethiopia to extend my stay in bali? 1. My journey is actually over, I’m back in Austria. I’m just behind with writing this blog. 2. I don’t know what they will do to you, but I guess it will not be nice. I wouldn’t do it. 3. I don’t know how it is for your country, but as Austrian you can easily get a visa from the website of the department of immigration. I don’t know if there is an Australian authority in Bali, but I would guess there should be one. Your advice regarding notifying Australian officials of your arrival into Darwin is not correct. The skipper/master must report 96 hours prior to their arrival into Australia all passenger and crew details and vessel details and intended date of arrival to Customs in Australia. If you don’t watch out Customs they will prosecute you like what happened to a few skippers in Queensland. Usually a smooth process when you arrive but don’t let them know you are coming better bolt down the hatches and prepare to be boarded! Thanks for your further information! I didn’t know that you had to report to Customs only 96 hours ahead. We reported to them two weeks ahead, still in Bali, and then again when we were checked by the first patrol plane (which was around 96 hours ahead). i will wanna go idoneshia to austrelia ….. Took the ferry from Tanah Merah, Singapore to Nongsa, Batam. And then, to the whole Riau Archipelago (Tanjung Balai / Karimun, Tanjung Batu, Kundur and Tanjung Pinang) by boats. Would love to experience the (sea) route from Indonesia to Australia in the future. Hey Louis. Im in Dublin aswell. Am planning a big trip myself aswell. Fancy meeting up to discuss a few things? Thank for you help .. Sorry, that I don’t know. I’m interested in travelling from Oz to Bali or (part of Indonesia). How does it work going the other way (like does the Skipper let customs know in Oz the details of my passport). Similarly on arriving in Bali do I rock up to customs and get my passport stamped? Presume I would need a travel visa also. Armin you are realy doing a good job by helping people . i wanna get full info about saling from singapore to australia so can you help to solve my promble? My problem is i can get 30 days visit to malaysia can i will catch any ship ,boat, or any thing like this which is going to australia or i have to pre plan about this? this is irfan from singapore, such a nice info you share but i have some confusion i will be great if you help me. actually i want to spend my money in australia so i am looking cheap way to reach there. from singapore what will be the easier and cheap way, via indoneasia or thailand or i can get ferry from singapore as you mentioned paid or unpaid. one last and most important thing i cant swim so is this a safe journey ? bcoz i scared from sea water. very interesting and valuable posting! So been trying to find the findacrew group on couchsurfing but it seems not to exist. Any ideas?. Really hurts that non premium members can’t contact other non premium members on findacrew.net. Could mean my ticket to Australia from Indonesia! Unfortunately I don’t have any contacts anymore either. I found my boat on findacrew.com, and it was a delivery from Poland to Australia. I trusted my feelings, that these people where not doing anything illegal. Hi I’m from Brisbane and I’m planning to ride my bicycle to Paris France from Brisbane I would like to know if I can catch a boat easily from Darwin Australia to on of the islands of Indonesia. Where then I can make my way throw South East Asia. Thanks. Hi! Just wondering what time of year ot was when you sailed? We are hoping to do this trip sometime this (northern) summer, I guess the yacht traffic is pretty seasonal? Cheers, Kirstie. That is a hell of an adventure! Awesome! Could you let me know with which cruise ship/company you went? I would like to do the same route in April. Looks great mate. Tenx! I’m in Europe right now so that could be Rotterdam, Hamburg or Venice or so. Hi, I got a lift from australia to Africa from findacrew (it took 10 days to find a lift and 4 months to get there throuh many adventures and amazing islands) and am now attempitng it again to south america via SE Asia. I recomment it to anyone, its a great (slow) way to travel and I only paid for shared food and occasional shared berthing fees to hose off the boat with fresh water. I’m a woman on my own, so don’t let fear stop you! It was! I always encourage others to- lower carbon use! I am attempting it again at the moment from Darwin to South America via SE Asia, but in the monsoon at the mo, so no boats unfortunately.. I have always wanted to sail/train around the world, and this information will definitely help. Thank you. me and my girlfriend are looking for a boat from asia or indonesia to Australia/NZ. We do have some sailing experience and plenty of time.